ELLSWORTH — The Ellsworth Elementary Middle School falcon baseball team will have two new dugouts for their 2019 spring season. In his pursuit of earning his Eagle Scout rank, eight-grader Willis Roy Hutchins planned, led and organized fundraisers, gathered local business donations, and coordinated volunteers to help build the dugouts for his school community. Will, a member of Boy Scout Troop #86, said he was a tiger cub when he wanted to build baseball dugouts for his Eagle Scout project. Will chose to build dugouts for Ellsworth Elementary Middle School because he saw there was a need in his school community. He knew the importance of having dugouts for baseball players as they provide weather protection, safety from foul balls, provide team unity and offer an opportunity for equipment organization during the games. Utilizing the generosity and volunteer hours of local businesses and community members, Will held a spaghetti dinner, car wash, Darlings Ice Cream for a Cause ice cream truck, lobster roll lunch, Sip n’ Swirl Paint and Design class and a back to school teacher lunch to help raise money. He raised 12,336.25 and donated the remanding monies to Ellsworth Elementary Middle School to put towards future softball dugouts. A total 1,192 volunteer hours was put into finishing the project. Will would like to thank Atwater Concrete, Hammond Lumber, Ellsworth American, Colby Builders, Inc., Andrew McCullough – Engineering Consultant, Home Depot, Tradewinds Variety, Darling’s, Darling’s Ice Cream for a Cause, Melanson Heath, Nautilus Marine Fabrication, Inc., Lee Credit Now, STAR 97.7, Jim’s Used Cars & Auto Repair, Inc., First National Bank, Dr. Gordon Trowbridge, DMD, Sweet Smiles, HSJ Management, D.C. Air & Seafood, Jones, Kuriloff & Sargent, LLC, Sargent Materials, Ellsworth Jewelers, Wallace Moving & Storage, Folsom Concrete, City of Ellsworth, Ellsworth School Department, China Hill, Sip n’ Swirl Paint & Design, Quality Construction, Dream Catchers Antiques & Collectibles and Rick Palmer’s All Around Construction for all their contributions. Will purchased a plaque to thank and recognize all the businesses that supported his efforts which is on the home dugout. On his path to his Eagle Scout rank, Will has also earned 39 merit badges, including the 21 Eagle Scout required merit badges. He is a member of the Order of the Arrow and has earned his Brotherhood Membership through Pamola Lodge 211 in the Katahdin Area Council. 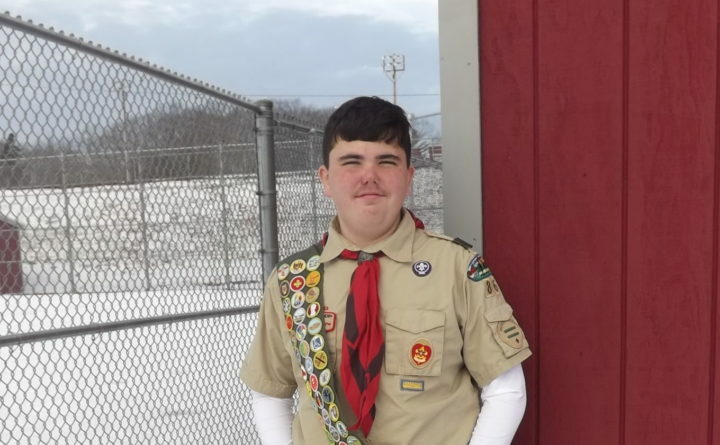 The final steps Will has to finish in order to earn his Eagle Scout rank are to have an Eagle Scout Board of Review through the Kathadin Area Council in Orono and send his final Eagle Scout paperwork to nationals. Will is the son of Lisa and Fred Backman of Winter Harbor.